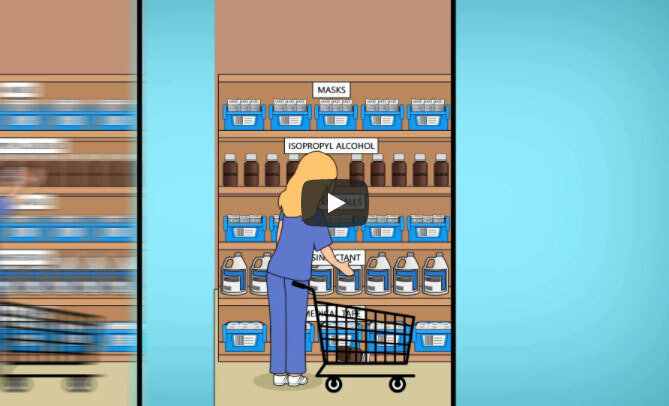 Automated replenishment at the point-of-use for distributors and their customers. eTurns cloud software increases inventory visibility, takes cash out, prevents stockouts and optimizes inventory in stockrooms and service trucks. 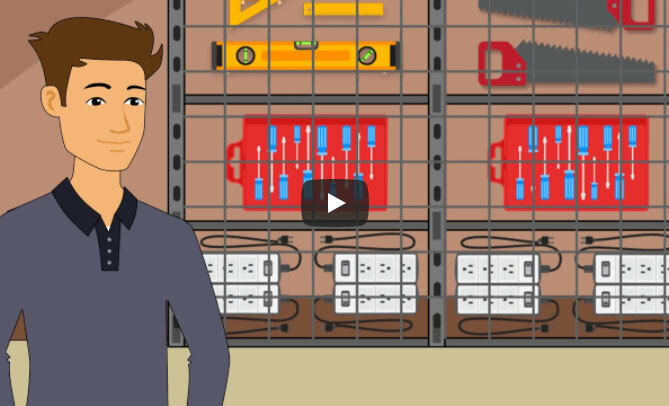 Manage and replenish MRO parts in a simple way with or without an ERP system. Maintain assets. Manage parts on service trucks. Control project spend. Track multiple tools. Trend consumption. 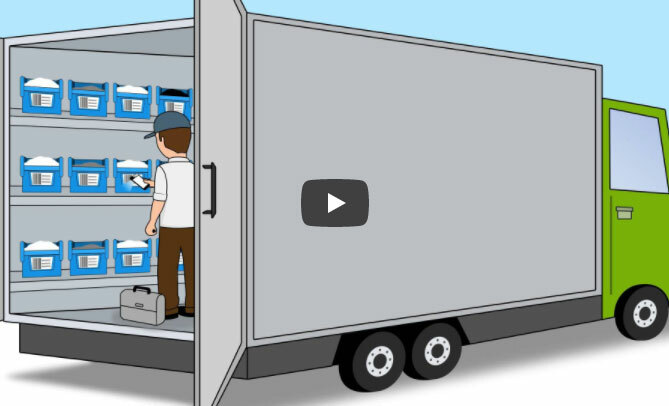 Stop ordering excess inventory to prevent stockouts. Optimize inventory. Reduce costs. Eliminate stockouts. Get automated par restocking. Prevent expired product and shortages. Track tools, maintenance, and parts needed for maintenance. Reduce time it takes to track tools by 80%. Get reports about who has what tool. 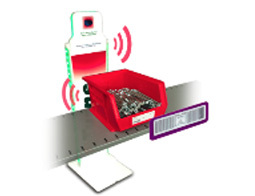 Scan barcodes to order, use & receive inventory which tracks real-time inventory status. 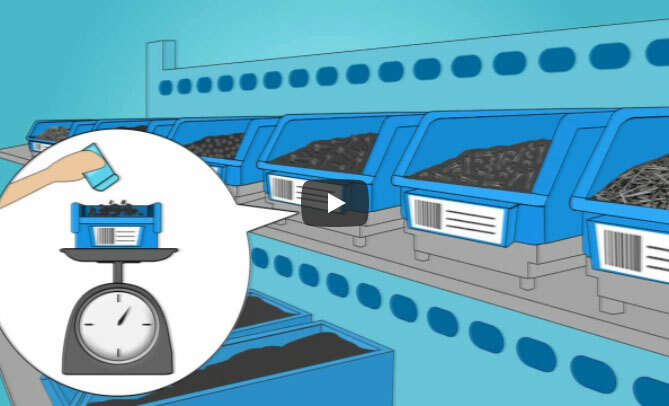 Weight sensors under bins track use and reorder automatically based on min/max. Amazon may ship orders quickly, but they don’t do demand-based automated replenishment of repeat orders well. This means that distributors have a huge opportunity to compete against the big guys and win by making automated replenishment based on actual usage an integral part of their value-added services offering and an excellent customer experience. eTurns TrackStock powers the automated replenishment service offerings of large and small distributors such as Graybar, Rexel, Anixter, Arrow, TTI, Digikey, and others. Using eTurns TrackStock Replenish inventory management app and a phone/scanner, users scan barcodes of items that need replenishment. Information such as item #, location, package quantity, and customer details are all captured with one scan. Tapping "Send PO" sends the orders through eTurns’ cloud directly to the distributor's ERP system. This process eliminates 90% of the time it takes to order from an e-commerce site where customers have to write down and key-in part numbers plus it helps keep customers from price shopping these items on other sites. TrackStock Replenish can be used by either distributor drivers/reps doing VMI or end-customers scanning for themselves (CMI). Up to 73% reduction in inventory value. Eliminate stockouts. eTurns customers who use TrackStock Manage inventory app to scan the items they use are able to track consumption, fine tune minimum/maximum levels using eTurns trending recommendations and therefore optimize inventory levels while avoiding stockouts. By optimizing inventory, eTurns' customers have decreased inventory value by up to 73%. 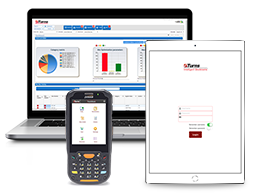 By using eTurns inventory software for automated replenishment on an ongoing basis, customers can continue to operate with over 70% lower inventory carrying costs. TrackStock keeps inventory managers in touch with their customers’ inventory by providing visibility and real-time monitoring of the status of all items at all times with any web browser. 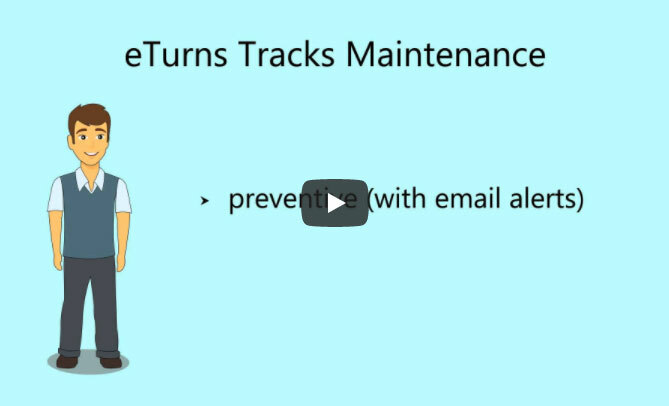 Users can set email alerts that are sent when thresholds are breached. Many “replenishment” inventory apps are just websites on a phone. These have two problems: 1) they require multiple scans, taps and steps to complete the order and 2) they are dependent on bandwidth and connectivity which limits usability in remote stockrooms. eTurns TrackStock automated inventory app works offline by design and syncs when needed. It also requires just one scan and one tap to send the order. 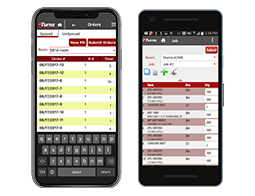 A distributor can offer eTurns TrackStock Replenish inventory management app to customers to replenish all consumables from all suppliers using only one tool. TrackStock will separate items by supplier -- the “sponsoring” distributor’s orders are sent directly from the customer to the distributor’s ERP system for timely replenishment, while other suppliers’ orders are sent through email. Meanwhile, the sponsoring distributor can see within the eTurns Bill of Materials all the items the customer orders from other distributors so they can compete for that business. 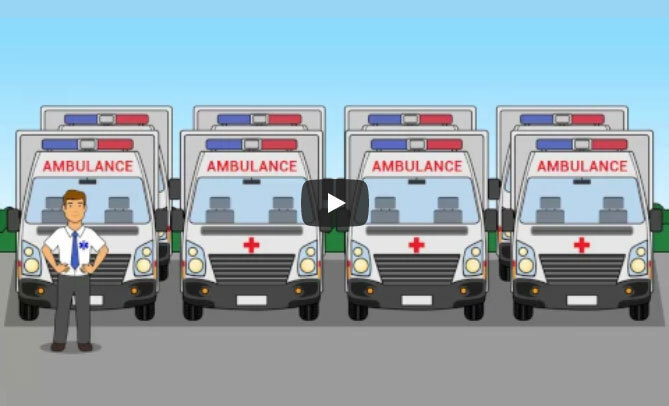 eTurns’ distributor customers have found that when they sell more than just products - but the easy replenishment of those products - they are able to increase revenue with those customers by up to 30%. By making replenishment easy with eTurns, customers have no reason to leave, and distributors end up increasing their share of wallet. Many inventory management software products use forecasts to determine replenishment timing, but eTurns TrackStock Manage can replenish based on actual usage history and calculate how the Min/Max/Critical levels should be set for all items. The user can set how close to the calculated Min/Max he wants to set the levels until comfortable that actual history is an accurate predictor of usage levels. 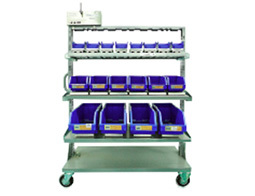 Receive email alerts when items fall below Min & Critical, prompting replenishment orders. eTurns TrackStock Manage helps distributors offer consigned inventory to their customers in a risk-mitigated way. By capturing each consumption transaction, TrackStock Manage allows the distributor to bill based on usage as TrackStock sends those transactions to the distributor’s ERP system. TrackStock also has the ability to hold these consumption transactions and send them weekly or on any schedule depending on customer agreement. Independently, eTurns TrackStock will continuously monitor on-hand quantities to trigger replenishment when the minimums are breached. Manage field service truck inventory with iPhones/Androids and the eTurns TrackStock Truck App. It helps contractors ensure they have the right parts on their trucks in the right quantities and creates work orders in seconds for immediate customer approval. The contractor simply scans out parts and records hours spent by creating an workorder on the Smartphone App. Since eTurns keeps track of what is on the truck, fewer parts disappear. Contractors make more money doing jobs and spend less time running to a store for parts. "Our company just implemented a 700 scale eTurns eVMI Sensor-managed Inventory Solution at a large powergen manufacturer in Ohio. The customer was very impressed by the nearly $1M stock reduction and access to real-time on-hand inventory data." "We were using a completely manual process that led to a stockroom filled with unused supplies and lots of stuff expiring. Switching to eTurns demonstrated significant change in a short period of time. The value of our inventory on hand was north of $75,000 when we started using the system; now we have around $20,000 sitting on the shelves. The drain on my time has been significantly reduced and continues to improve." "Since we’ve starting using eTurns with our customers 4 years ago, we’ve grown revenues over 20% with these customers due to just how simple they make it to track consigned inventory. Equally important, eTurns support is one of the best I have experienced."